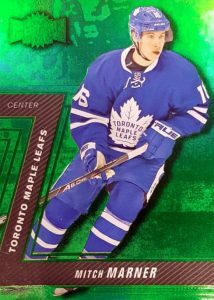 Bringing the inserts of the 1990s to modern NHL stars and rookies, 2016-17 Fleer Showcase Hockey maintains a legacy of wild designs and rare cards. Collectors can find one autograph per hobby box along with quite a few inserts and parallels. 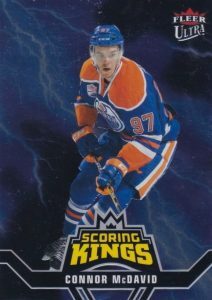 While the 2015-16 edition promised three hits per box, this new configuration yields a lower box price. Kicking things off, the 100-card base set for top players is accompanied by Hot Prospects (#/399) rookies cards and Hot Prospects Quads (#/399). Parallels enhance this main set with Red Glow (Base - 1:6 packs; RC #/25) and White Hot (#/25 or #/5). Adding to the Hot Prospects options are Hot Prospects Autos (#/499 or #/299) with Red Glow (#/49 or #/25) and White Hot parallels (#/15 or #/5). Incorporating a relic piece, Hot Prospects Auto Patches (#/135 or #/85) also has White Hot FX (#/10) parallels. 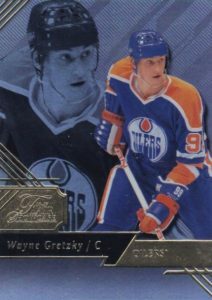 Just like in previous years, 2016-17 Fleer Showcase Hockey honors some of the most popular sets of the past. 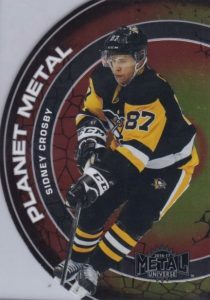 Metal Universe (1:5 packs) come in base form while Previous Metal Gems (PMGs) parallels put a new spin on the foil-covered inserts. Options include Red (#/150), Blue (#/50), Green (#/10) and Purple (#/5). Ultra Rookies (#/599) also sees good coverage with Platinum Medallion (#/99) and Ultra Violet Medallion (#/25) versions. Continuing the format of a limited insert with even more rare parallels, Skybox Premium Prospects cards are numbered to 499 and offer Star Rubies (#/50) and Sparkling Diamond (#/5) parallels. Flair Row 0 Rookies and Flair Row 1 inserts each average 1:5 packs with Blue Ice (#/199 or #/99) and 1-of-1 Masterpiece parallels. Debuting the ever-popular EX brand into Fleer Showcase, EX-2017 (1:18 packs) highlights 42 players with base Legends and Rookies as well as limited Essential Credentials Future and Now parallels, each numbered to 42 or less. 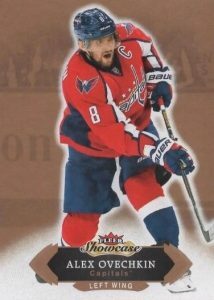 Rounding out the 2016-17 Fleer Showcase Hockey inserts are Flair Hot Gloves (1:90 packs), Ultra Scoring Kings (1:12 packs), and Metal Universe Planet Metal (1:60 packs). PARALLEL CARDS: Red Glow - 1:6 packs, White Hot #/25. 18 cards. Serial Numbered #/399. Shop on eBay. There is a gap between the Quads in the checklist numbering. PARALLEL CARDS (Only #101-110): Red Glow #/25, White Hot #/5. 30 cards. Serial Numbered #/399. Shop on eBay. PARALLEL CARDS: Red Glow #/25, White Hot #/5. 59 cards. Shop on eBay. PARALLEL CARDS: White Hot #/15 (#141-180); White Hot #/5 (#181-190). PARALLEL CARDS: White Hot Autograph Patch #/10. 42 cards. 1:18 packs. Shop on eBay. PARALLEL CARDS: Essential Credentials Future #/42 or less, Essential Credentials Now #/42 or less. Now parallel uses card number as serial numbering (i.e. card #1 is 1/1); Future uses inverse (i.e. card #1 is #/42). 50 cards. 1:4.5 packs. Shop on eBay. Row 1 PARALLEL CARDS: Blue Ice #/99, Blue Ice Masterpiece 1/1. Row 0 PARALLEL CARDS: Blue Ice #/199, Blue Ice Masterpiece 1/1. 10 cards. 1:90 packs. Shop on eBay. PRECIOUS METAL GEMS PARALLEL CARDS: Red PMG #/150, Blue PMG #/50, Green PMG #/10, Purple PMG #/5. 15 cards. 1:60 packs. Shop on eBay. 30 cards. Serial Numbered #/499. Shop on eBay. PARALLEL CARDS: Star Rubies #/50, Sparkling Diamonds #/5. 30 cards. Serial Numbered #/599. Shop on eBay. MEDALLION PARALLEL CARDS: Platinum #/99, Violet #/25. 25 cards. 1:12 packs. Shop on eBay. Serial numbered #/25. Shop on eBay. Features buybacks from 1992-93 Fleer Ultra. Cards look to be nice, however, the checklist is a joke! Could it be any more thin? extremely limited in terms of vets or legends. 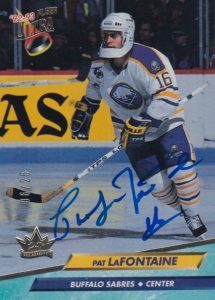 Less hits than prior years and a strange configuration change, no Patch per box anymore?? Why dose UD not include eichel in thier set. It’s it due to him signing an auto dealers with leaf? Love PMG cards. Looking forward to adding my my McDavid collection. 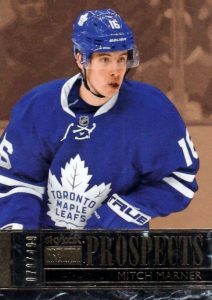 Also noticed UD followed up the employee exclusive PMG rookie set with another rookie set this year. Last year’s set was numbered to 150 and this year the set is numbered to 175. 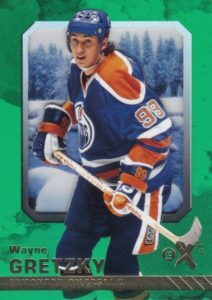 Can’t wait to see what the Fleer PMGs look like this year. 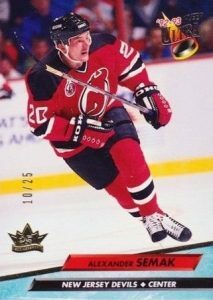 I pulled an unsigned Luc Robitaille 92 Ultra buyback. Why not go the slight extra step and get them all signed? It’s only numbered out of 25.
just an average product. I love the exls. as ususal this product has two many different rookie sets. but for price the product is not bad. Maybe I’m biased, but this product, (like most 16-17 products), represent the Kings with only 3-4 players, and those 3-4 players are not even presented in all the inserts. The Kings had 4 rookies start this year. Sad. Sad. Sad. Guys, we have to stop giving negative feedback on everything lol. Last Year, patch was on 499, one color and could be a non star rookie auto patch. Now , we have a box for 100$ with one auto for sure, maybe a patch. only 135 so make it hard and more valuable. One ex per box, rookie Ultra and etc. this products , for the price and the rookie class , is really good. I am going to give my completely biased and invalid opinion, because it’s based on only one half case group break I bought in to; but here goes anyways! 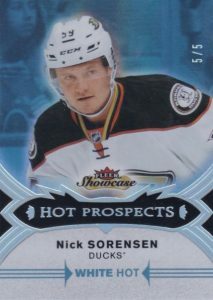 Any idea if any of the Hot Prospects Quads players will get cards of their own? I know some of them already have rookie cards, but a number of them do not. What is the deal with Laine Rookie Auto Patches? Some are numbered to 85 and then the same card is numbered to 135? Is this a numbering issue or did Upper Deck make more card than listed on the checklist in this product? OK product. Way too many rookie subsets though. The base cards are dull, but the checklist looks ok. EX-2017 are a nice addition. I love acetate cards, but it would have been cool if they were serial numbered. On the other hand, the Metal Universe Planet and Scoring Kings are awful. The design is too childish and tasteless. 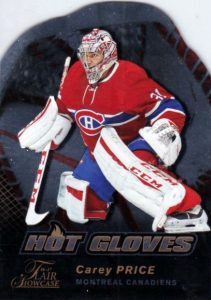 The Flair Hot Gloves are nice too with their glove shape but they could have put more goalies in the checklist. Just broke a box last night to see this product in real. Seems pretty solid. By a simple calculation, these are falling very rarely, so I am glad for that pull. Love the quality of the Rookie Auto cards. Decent price point for the hit potential. Has anyone else seen the Laine Patch Auto /135 cards on eBay? Are those not counterfeit? List above only lists /85 and /10 for Laine Patch Auto. We got clarification from Upper Deck and apparently there are still just 85 copies of the base auto patch for Laine. It appears some were mistakenly stamped as being out of 135. UD will correct the numbering if you contact them and send in your card. Martin Frk is the Canes Hot Prospect? Seriously, this couldn’t have been change after he was canned from Raleigh after his brief but regrettable stint here? Thank god there are only 5 of those cards in the world! Opened a hobby box last night and hit 4 autographa in the same box along with a Matthews blue ice #’d to 199. Ive heard of two autos including the buy back card. Has anyone hit 4 prospect autographs? I was quite surprised and pleased I must say.